Finally, a new Gantt-free approach to project management that all project teams will love to understand! We are a team of experienced project managers with a passion for innovation. After many years of project management in leading global organizations, we realized that something was missing. Methods and approaches are in abundance, but people are avoiding them like the plague, thus negatively affecting projects. Organizations today are constantly evolving and changing while the project management approach is lagging behind. Even the simple structure of a “project manager” running “his/her” plan and pushing the “project team” to action is changing. Teams are looking for collaboration, a project plan that can be related to as “ours”. Such a plan should be clear and easily to understood by all team members, and while it may seem trivial, it’s certainly not what people are getting from current project management approaches. GANTT charts are too old and lack the agility required for handling the fundamental challenges of the 21st century, rendering project management without even a project scheduling solution. We felt it was time for a new project management approach. A solution that will account not only for project scheduling, but also for project collaboration, coordination, risk avoidance and of course KPIs. We called this new approach “Projectmap”, and it covers all project management requirements, which can all be displayed on a single screen! Finally, Projectmap is always looking for contributors. If you like the concept and want to add your ideas – send us a note. If you want to spread the word – just let us know! We are project managers and we will be excited to learn from your experience and share it with others. 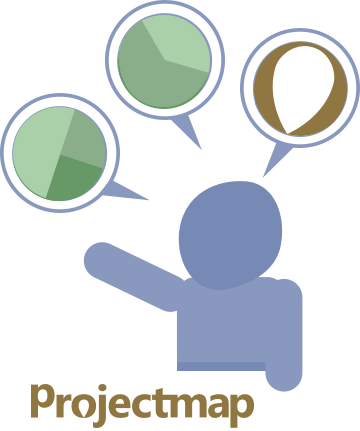 Projectmap is set to revolutionize and reshape the world of Project Management! At project kickoff or when the project goes out of bound – the team needs a method for “sketching” their thoughts on a note, a whiteboard or canvas. Projectmap covers this need by providing a diagram that can be used as an electronic whiteboard. Placing activities, creating links and assigning activities to owners is probably the most important part when creating a project plan. Projectmap helps project managers by planning right out of the sketched thoughts. No data transfer required. With a plan in place, the team must analyze if it’s feasible at all, and if not, what should the team do to make it feasible? Projectmap supports this need by analyzing the project structure automatically, from the information provided by the project team. Analysis is limited if it can’t be measured. Projectmap provide a set of KPIs that can be calculated to show the project delivery confidence level.